Ships in two cartons—ORDER BOTH. All hutches include fully finished back panel and smart fabric covered Tackboard. Mounts on 72W Desk Shell, 72W Credenza Shell, RH/LH Corner Module, two 36W 2-Drawer Lateral Files placed side-by-side, or one 2-Drawer Lateral File placed adjacent to the deep end of a Corner Module. Accepts the addition of two Task Lights (sold separately). Features self-closing, Euro-style hinges. Accessible work-in-progress trays keep projects handy. Enhance your existing Series C Collection with a coordinating Height Adjustable Table. Easy integration with other Series C Elite components for a total design. Create a complete workstation by adding the Series C 72W 2-Door Hutch for classic styling with clean lines and extended modesty panels. Create the perfect combination of form and function by mounting the Hutch to the 72W Desk or Credenza Shell, Corner Modules and combined Lateral Files. Constructed with 100% thermally fused laminate for durability and superior resistance to scratches and stains. 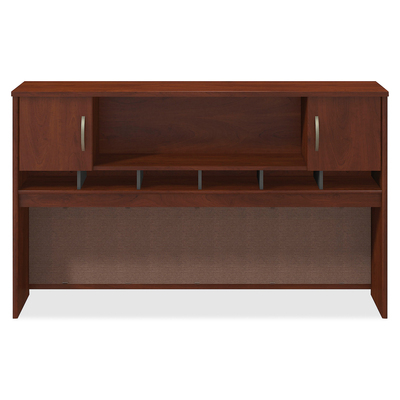 The Hutch includes a central open storage, six work-in-progress shelves and a closed storage compartment with self-closing, Euro-style hinges for a soft close. Wire management grommets provide pathways to keep plugs and cables under control. Enjoy a fully finished back panel with a fabric covered tackboard to create additional space for organizational notes and calendars, plus it accepts two Task Lights to enhance illumination.